It is true whenever you buy a new smartphone it performs smoothly for sometime. But soon it starts to lag and the usage is no longer smooth. This case also applies to iOS devices like iPhone, iPad and iPad. iPhones have now grown bigger with massive storage spaces. You can find an iOS device ranging from 16 GB to 256 GB. 256 GB is a lot more space and most users won't notice any lag or crashes until the storage gets full. But if you are a 16 GB iPhone user then I bet that once your phone's storage gets full then you definitely start to get problems with your iDevice. These problems are mostly related to storage. When their is no more storage space left on your iPhone then you can't click photos any more, you can't install new apps and most of all you will see that your iPhone has become very slow because of no space left. Here we present to you iMyFone Umate which is the number 1 cleaner software for iPhone and other iOS devices. This iPhone cleaning software is available to download for both Mac and Windows 10. 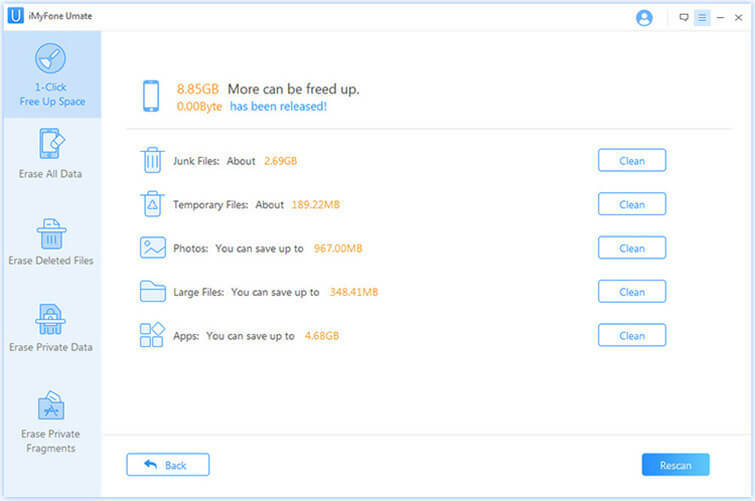 It lets you manage your iPhone's storage space without any data loss. iMyFone Umate is an easy to use iPhone cleaner that even works with iOS 10. It can perform following tasks. Clean up temporarily files from iOS device. Backup photos from iPhone and delete them to claim more space. 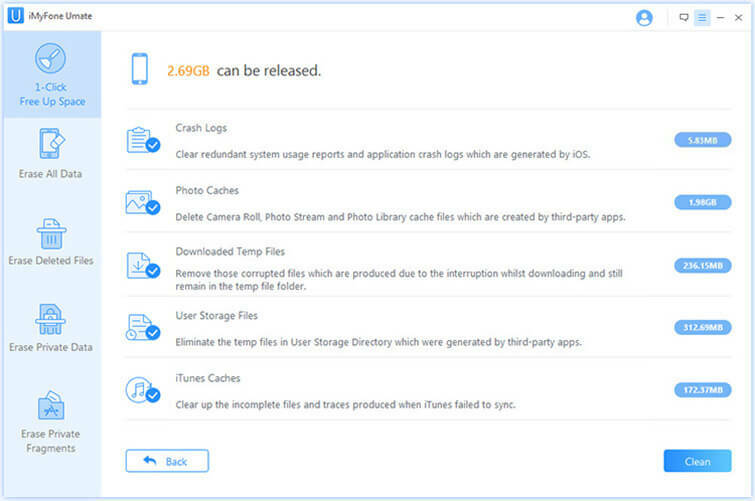 Backup large files first and then delete them from internal storage of your iOS device. Download and install iMyfone Umate from this link. You can download the software for Mac and Windows 10 from the above link. After installation open the program. It will ask you to connect your iPhone or any other iOS device. Use a USB cable to connect your device to PC. Let iMyFone Umate recognize your iPhone. After detecting the device, iMyFone Umate will show the storage space used on your iPhone. 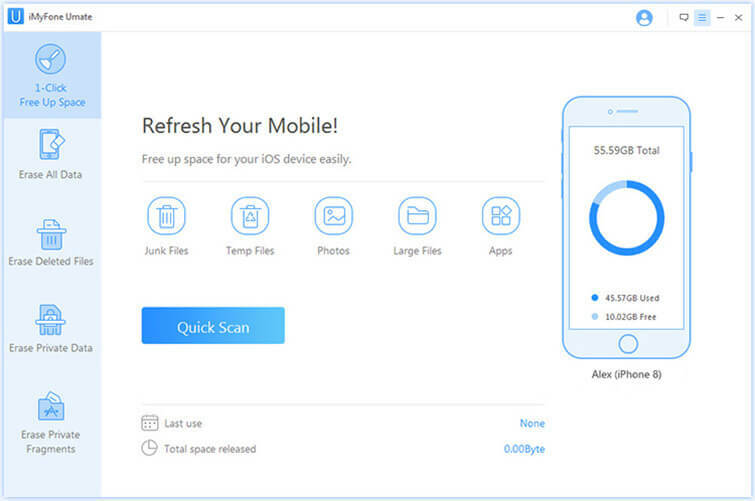 Click 'Quick Scan' to let the software scan your iPhone for junk files, temporary files, photos, unused apps and large files. The scan results will be displayed on the screen showing the complete list of items that need attention. A clean button will appear next to every option that is to be cleaned. Click this button to launch the individual cleaner. Click the 'Clean' button next to 'Junk Files' in the image above. It will open up the list of all junk files stored on your iPhone. See image below. The click 'Clean' again the green button on the bottom right corner to start the junk files cleaning process. After cleanup you will see how much space has been released and how much can be freed. The similar way you can clear temporary files. With iMyFone Umate you can compress your iPhone clicked photos losslessly. By lossless compression we mean that the image quality won't have any difference after compress. Only the image storage size is decreased. Go to the homepage and click 'Photos'. Then either click 'Backup & Compress' or 'Backup & Delete'. The first option will backup your photos to PC in original quality and then start to compress them. The compressed images will still reside on your iPhone. In the second option a backup is created of your original photos to PC and the photos are deleted from the iPhone's storage. Go to the home by clicking the 'Home' button. Or click 'Large Files' on left panel. If nothing shows up click 'Rescan'. The files having size more than 5 MB will be listed here. You can select files and click the 'Backup & Delete' button to remove that files from your iPhone. The backup will be saved to your PC. If you have lots of apps installed on your iPhone then you can manage them via iMyFone Umate. All apps will be listed in unused apps section. From here you can select which apps to keep and which to delete. After selecting unused apps click 'Remove'. iMyFone Umate is indeed a great cleaner app that not only works with your iPhone but supports iPad and iPod too. 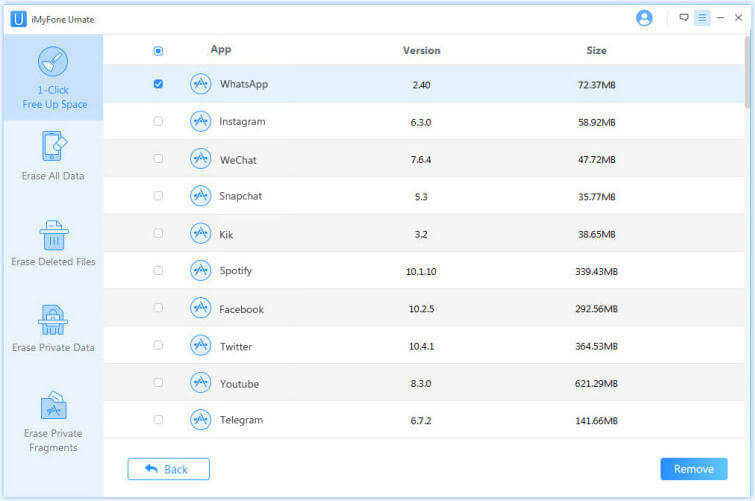 It lets you manage the storage space of your iOS device by giving you the full control over your device's storage. Unlike other cleaning apps this software is much more convenient because it deeply scans your iPhone's storage. 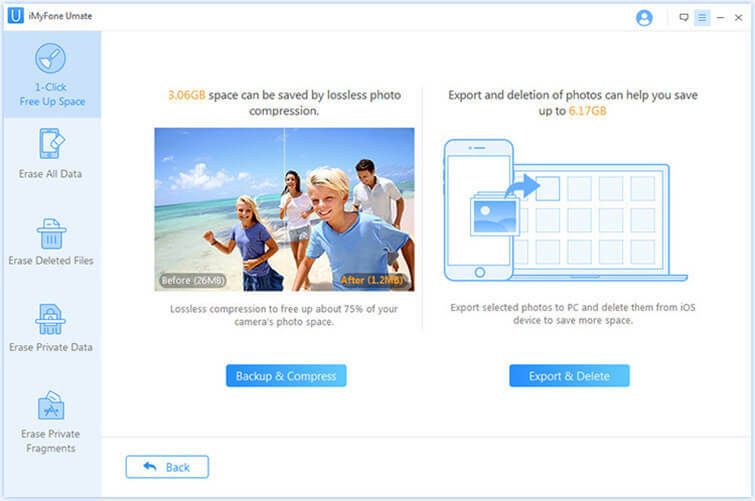 You can also manage and compress photos losslessly and original photos backup is stored to your PC. If you are running out of storage on your iPhone then iMyFone Umate is our ultimate recommendation to you. iMyFone is available to purchase for both Mac and Windows. The lifetime license for 1 user costs $19.95 for Mac and Windows. You might have bought many iPhone cases in that much amount. But at just $19.95 iMyFone Umate is the ultimate cleaning software for your iPhone. It comes with a 30-Day money back guarantee. It is easy to use and provides useful tools to manage your iPhone storage. Currently iMyFone is running Christmas promotions and they are giving huge discounts. You can check and buy this software from the link below.